The Rococo toad, Rhinella schneideri, Argentina. 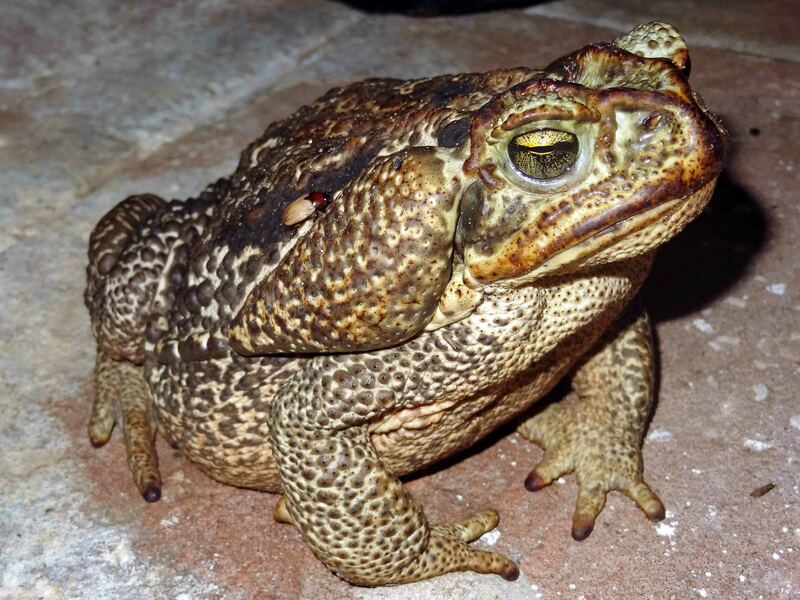 It is called the Cururu Toad, or the Rococo Toad. 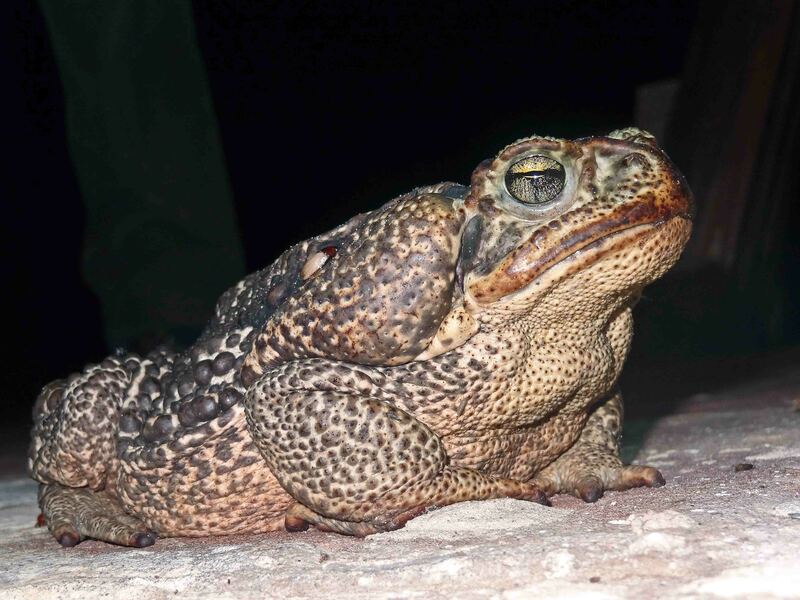 Cururu is a river in the Pará state of north-central Brazil; presumably a lot of these toads live there! Rococo is however, a very good alternative name for this toad; the word was derived from the French word “rocaille”, which means pebbles and refers to the stones and shells use to decorate the interiors of caves. The toad looks very much like it is covered with small pebbles. 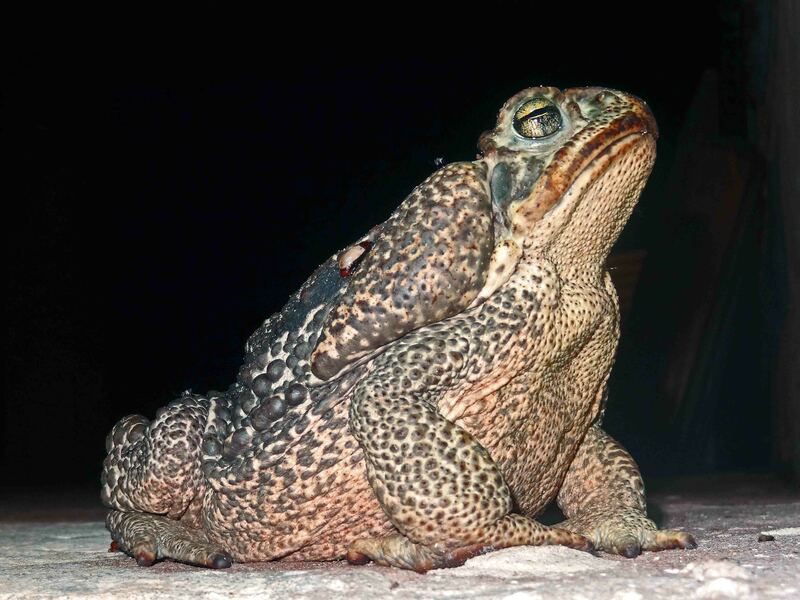 Don’t try eating this toad! It has poison glands on its back legs, as well as on either side of its head, which can squirt a poison, which causes eyes or mucous membranes to burn painfully. According to one report, ‘a dog that has taken such a toad in its mouth will immediately and yowling release it’! (3) But the interesting thing is that some of the complex organic compounds found in the skin secretions from this toad – at least 10 different compounds have been isolated – are highly active against human cancer cells (4). So who knows, perhaps it contains a cure for cancer? I took these photographs in March 2012, at a ranch in Corrientes Province, northern Argentina. The frog was obviously feeding on insects attracted to the lights on the buildings at night. I did not notice it at the time, but there is a red and white beetle on the back of the toad. What is it doing? In may be a prey item that just made a lucky escape, or perhaps there is some other sort of relationship occurring? Is it feeding on something on the toad? Who knows? 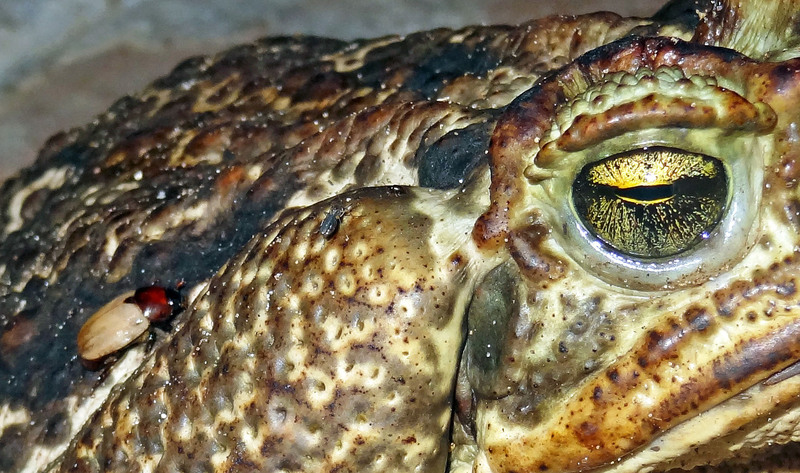 There is also a mosquito feeding on the toad (just behind the right eye), sucking the blood no doubt – see below. This blog has reminded me once again, that once you start looking closely at an animal, all sorts of interesting – and sometimes unexplained things – pop up! 4) Cunha-Filho, Geraldino A., et al. (2010). Cytotoxic profile of natural and some modified bufadienolides from toad Rhinella schneideri parotoid gland secretion. Toxicon 56(3): 339-348. Previous Previous post: Old blue eyes! Next Next post: Rocky Rococo the pebbly toad!